Located in Old Goa, India, the Basilica of Bom Jesus is a UNESCO World Heritage Site. The foundation stone was laid on 24th November 1594, and completed on 15th May 1605. It was raised to the status of a minor Basilica in 1946 and is considered to be one of the best examples of Baroque architecture in Goa. The church is called "Bom Jesus" meaning "good Jesus" or "infant Jesus" to whom it is dedicated. The Basilica holds the mortal remains of St. Francis Xavier in Goa. 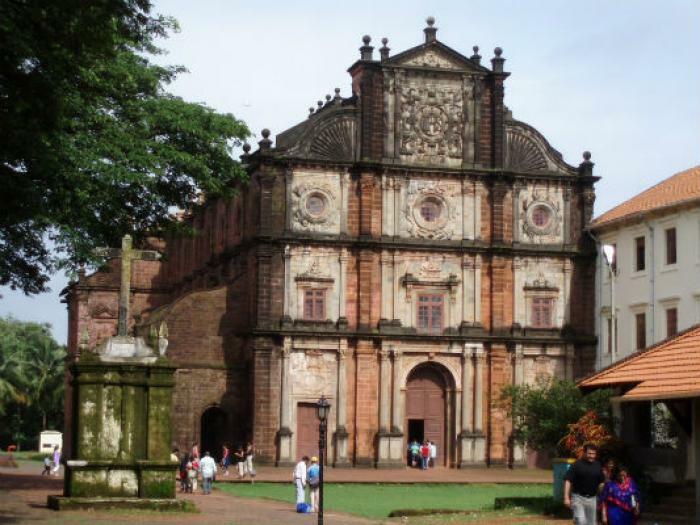 The Basilica of Bom Jesus Church is more than 400 years old. LOS ANGELES, CA (Catholic Online) - St. Francis Xavier died on 3rd December 1552, on the Chinese island of Shangchuan, at the age of 46. 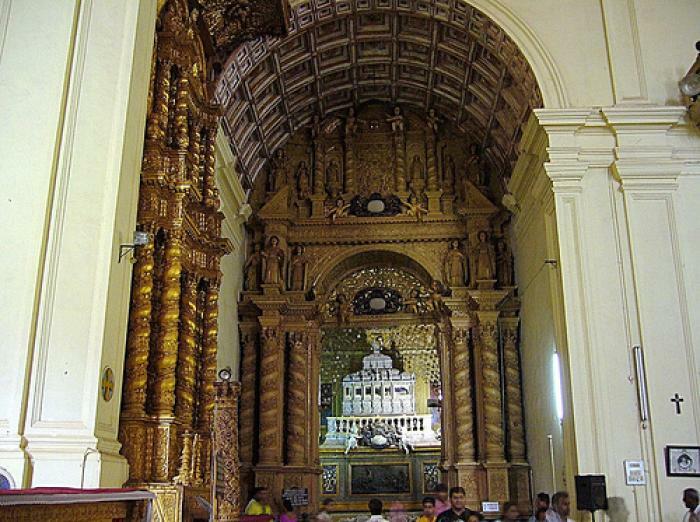 Before his final resting place in the Basilica of Bom Jesus in 1624, his body was buried in three different countries. Each time the body was exhumed, it was found to be fresh and incorrupt. St Francis was regarded as a saint during his lifetime, and was canonized in 1662. His remains are ensconced in a glass container encased in a silver casket in the Basilica. Bom Jesus is visited by devotees in large numbers each year. Get the finest translation of the Scriptures available, based on the Dead Sea Scrolls and latest scholarship. Though St Francis Xavier died on his voyage to China and was buried there, his body was brought back to Goa after two years, in accordance with his wish. We bring to you some very interesting facts about it. - Basilica of Bom Jesus Church is more than 400 years old. - Construction work on the church, which later became a basilica, began in 1594 and it was consecrated on 15th May, 1605 by the Archbishop, Dom Fr. Aleixo de Menezes. Construction work on the church, which later became a basilica, began in 1594 and it was consecrated on 15th May, 1605 by the Archbishop, Dom Fr. Aleixo de Menezes. - Public viewing of the body of St. Francis Xavier is held every ten years. This event attracts lakh of pilgrims from around the globe. - The body of St Francis Xavier, when brought to Goa, was laid in St. Paul's church. 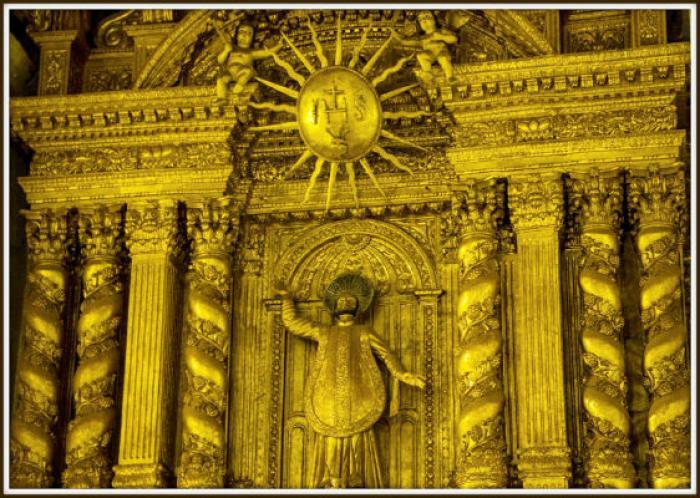 It was after St. Francis Xavier was canonized, in 1662, that the body was shifted to Basilica of Bom Jesus, where it remains till date. Public viewing of the body of St. Francis Xavier is held every ten years. This event attracts lakh of pilgrims from around the globe. - Though St Francis Xavier died on his voyage to China and was buried there, his body was brought back to Goa after two years, in accordance with his wish. It was then discovered that the body was still intact. 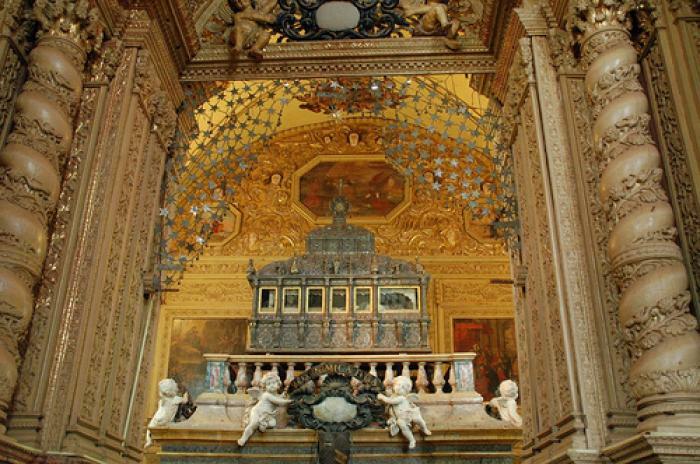 - The mausoleum, on the top of which is the silver casket that holds the body of St. Francis Xavier (1696), was the gift of the last of the Medicis, Cosimo III, The Grand Duke of Tuscany. The basilica is one of the oldest churches in Goa. It stands carpeted with marble flooring and inlaid with precious stones.